Wash and dice all fruit, keeping them separate and discarding pits. 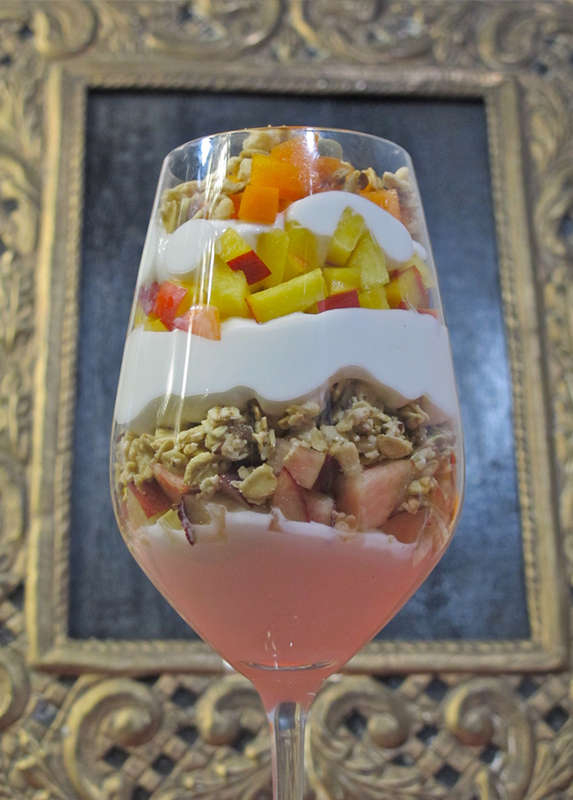 Layer glass with yogurt, then 1/2 of the white peach, then 1-2 Tablespoons of granola, then yogurt, 1/2 the yellow nectarine, yogurt, 1/2 the apricot, and a bit of granola. Add a drizzle of honey if desired. Repeat for the 2nd glass. Here at Kingsburg Orchards harvest over 200 varieties of fresh fruit including White Peaches, White Nectarines, Pluots, Apple Pears and Apriums. We are a grower, packer, and shipper in Central California’s San Joaquin Valley, and we’ve always maintained our eye for detail and our commitment to quality.